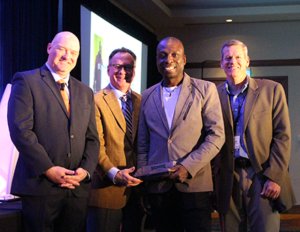 INDIANAPOLIS – Announced recently at its 63rd Annual Partnership Conference, three drivers were awarded top honors as Bekins Van Lines Drivers of the Year. These awards are given to individuals who earned the Driver of the Month award from September 2016 through August 2017 and who consistently provide superior service to Bekins’ customers. By their excellent records in claims, customer service and safety, these drivers are among the best in the van lines’ fleet. From left: Executive VP A.J. Schneider, CEO Mark Kirschner, Direct Lease Fleet Driver of the Year Delroy Robinson, and VP of Operations Ron Borkowski. Direct Lease Driver of the Month for May 2017, Delroy Robinson of Waterbury, Conn., has 16 years of experience as a household goods driver. He maintains a top driver performance rating and has won three Driver of the Month awards. 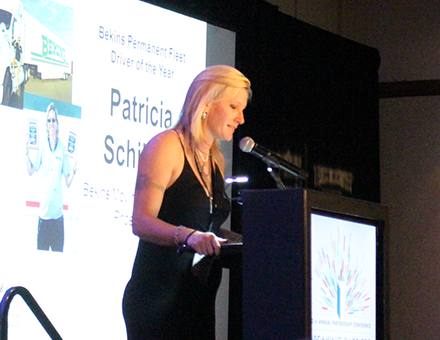 Patricia Schilling, Bekins Moving Solutions, Phoenix, Ariz., (pictured above) earned Bekins’ Permanent Fleet Driver of the Month award in March 2017. Patricia has six years of experience as a professional mover. She has won two Driver of the Month awards with the van line. Earl Harvey, A & W Transfer & Storage Co., Amarillo, Texas, earned Bekins’ Intermittent Fleet Driver of the Month award for July 2017. Earl has more than 15 years of experience as a professional mover and is a very reliable operator. Wheaton Van Lines, Inc. is one of the world’s most highly regarded providers of transportation services. Wheaton Van Lines now owns three household goods relocation brands, Wheaton World Wide Moving, Bekins Van Lines and Clark & Reid. The van line is now the fourth largest household goods carrier. Headquartered in Indianapolis, Ind., the Wheaton, Bekins and Clark & Reid brands offer private and corporate domestic and international household goods relocation services as well as special commodities and logistic services. The United States Military also is one of the company’s largest customers. Wheaton Van Lines, Inc. is partner to approximately 330 Wheaton and Bekins agents nationwide. To learn more, visit www.wheatonworldwide.com, www.bekins.com or www.clarkreid.com.